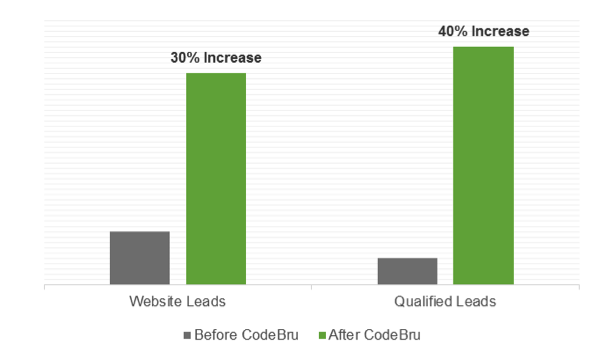 A top-rated digital marketing and design agency approached CodeBru with a three-pronged optimization challenge. The client agency needed to improve their website to feature: a streamlined design, the ability for existing personnel to edit the website with ease, heightened security, and the capability to grow along with the agency. The previous WordPress site did not fit their expanding needs and the agency was without an in-house web developer. In the absence of internal web development talent, the agency also wasn’t able to provide their clients with a full range of web development services. This gap in their offering hindered the agency’s ability to expand their client base and business offering. Finally, the agency needed modernized tools to capture monthly analytical information for their clients –, the agency was working from an Excel sheet which required an average of five (5) working days to complete each month. This drain on resources kept the agency from allocating the skillsets of their team most effectively. After thoroughly assessing this agency’s challenge, CodeBru applied a proven UX methodology to solve the agency’s problems, and put the agency back on the path to success. CodeBru addressed the most urgent issue – the agency’s website – first. After examining the drawbacks of the previous website and applying knowledge of the agency’ s vision/mission/values and marketing philosophy, CodeBru developed a new design which offers new functionality and features. CodeBru also researched the agency’s competitor websites, to ensure their digital impact was differentiated and compelling. CodeBru then leveraged its web development experience with the agency to create a structured partnership for delivering a comprehensive suite of web development services to the agency’s clients. CodeBru then applied troubleshooting techniques to the agency’s existing data collection tools to enhance efficiency and performance. CodeBru focused on the agency’s Excel template to find process gaps, and used it as the framework for a next generation solution. Functional upgrades such as automated Google Analytics data downloads were incorporated and user process was improved. The agency’s new website from CodeBru has all the advantages requested: better design, easy editing, growth potential, and higher security. As part of their greater rebranding effort, the agency has seen an increase in exposure and potential clients. Their resources coordinated, CodeBru and the agency continue to team up to ensure the agency’s clients receive the fullest extent of web design product and service offerings. With CodeBru’s newly designed data capture tool, monthly analytics projects which formerly took five days now take only ten minutes – freeing up the agency’s resources for other tasks and increasing efficiency.